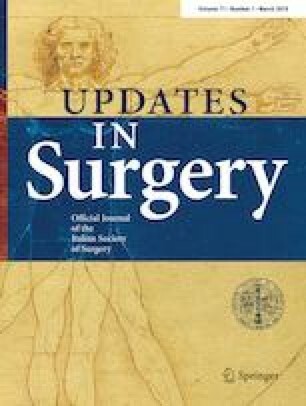 Laparoscopy accounts for > 70% of general surgical cases. Given the increased use of laparoscopy in emergent colorectal disease, we hypothesized that there would be an increased use of laparoscopic colectomy (LC) in trauma patients. In addition, we hypothesized increased length of stay (LOS) and mortality in trauma patients undergoing open colectomy (OC) vs. LC. This was a retrospective analysis using the National Trauma Data Bank (2008–2015). We included adult patients undergoing LC or OC. A multivariable logistic regression model was used for determining risk of LOS and mortality. We identified 19,788 (96.8%) patients undergoing OC and 644 (3.2%) who underwent LC. There was a 21-fold increased number of patients that underwent LC over the study period (p < 0.05), with approximately 119 per 10,000 trauma patients undergoing LC. The most common operation was a laparoscopic right hemicolectomy (27.5%). LC patients had a lower median injury severity score (ISS) (16 vs. 17, p < 0.001). There was no difference in LOS (p = 0.14) or mortality (p = 0.44) between the two groups. This remained true in patients with isolated colorectal injury. The use of LC has increased 21-fold from 2008 to 2015, with laparoscopic right hemicolectomy being the most common procedure performed. There was no difference in LOS, in-hospital complications, or mortality between the two groups. We suggest that LC should be considered in stable adult trauma patients undergoing colectomy. However, future prospective research is needed to help determine which trauma patients may benefit from LC. This research involved humans. However, since this retrospective study was performed using a national database with deidentified patients, risk to participants is minimal. There is no consent required.